The beauty of the Technivorm Moccamaster KB741 glass carafe is the lightweight glass and sturdy ergonomic handle. Here's a cautionary tale. If you have a really small prep sink and you carelessly angle the carafe under the faucet to rinse it out but instead whack it hard against the porcelain sink and metal faucet it might break. Lesson learned! Never fear, get your replacement carafe here. Includes mixing tube lid. 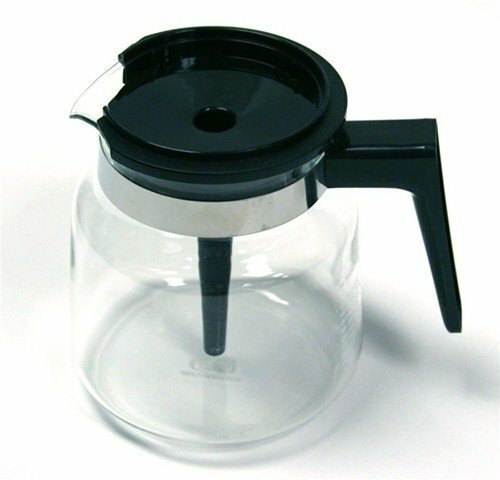 Technivorm Moccamaster Glass Jug 1.25 liter black with mixing lid fits KB741. It also fits H741 and K741 but then you do not use the lid with mixing tube as the filter basket sets directly on top of the carafe. For those models you may want to consider Carafe Lid #13313 in addition. Sure you could fill this Technivorm carafe to the top and squeeze 46 ounces in it, but really, let's play this one safe and stick with the recommended 42 ounce capacity.